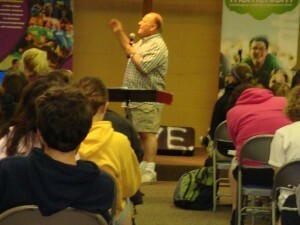 In Pennsylvania, Ed Lewis teaches the Operation Barnabas students about world views at Outreach Session 2. While the teens are warming up in Pennsylvania, the Operation Barnabas International team is gathering in California. Slated to head to the Philippines on July 18, the team returns to the mainland on July 8 after a two-day stop-over in Hawaii to minister at a Grace Brethren church there. While in the Philippines, they will be working with Dan and Tori Beaver and their ministry on Boracay Island. Taken from the Biblical character, the name Barnabas means “Sons of Encouragement” and Barnabas young people strive to encourage others; not only through work and programs, but by their attitudes, their lifestyle, and their faith. Operation Barnabas is a ministry of CE National.